Use the following procedure to create a cluster. To access the High Availability management web interface, point your browser to the link provided by the luci service and log in using the root account on the node hosting luci. Logging in to luci displays the luci Homebase page. To create a cluster, click on Manage Clusters from the menu on the left navigation pane of the Homebase page. This displays the clusters page. From the clusters page, click the Create button. This displays the Create New Cluster screen. On the Create New Cluster screen, enter the parameters for the cluster you are creating. The Password field will be the ricci password you defined for the indicated node. 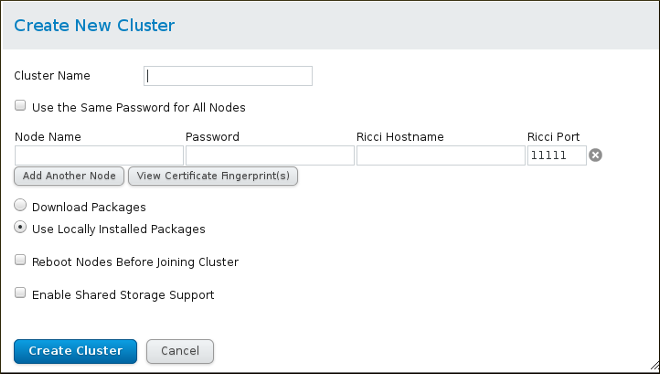 For more detailed information about the parameters on this screen and information about verifying the certificate fingerprint of the ricci server, see Section 4.4, “Creating a Cluster”. After you have completed entering the parameters for the cluster, click the Create Cluster button. A progress bar is displayed with the cluster is formed. Once cluster creation has completed, luci displays the cluster general properties. 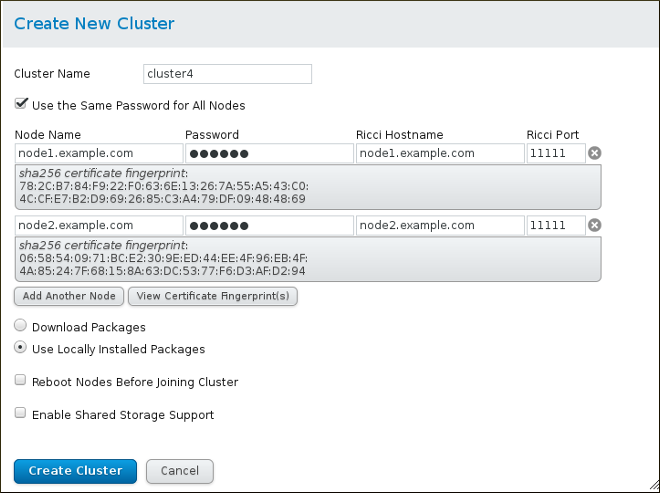 Verify the cluster status by running the clustat command on either node of the cluster. If you cannot create the cluster, double check the firewall settings, as described in Section 3.3.3, “Configuring the iptables Firewall to Allow Cluster Components”. If you can create the cluster (there is an /etc/cluster/cluster.conf on each node) but the cluster will not form, you may have multicast issues. To test this, change the transport mode from UDP multicast to UDP unicast, as described in Section 3.12, “UDP Unicast Traffic”. Note, however, that in unicast mode there is a traffic increase compared to multicast mode, which adds to the processing load of the node.